I can't download either rocovery console, or combo fix, this IE windows simply pile up and do nothing. Is this an office computer? Do you have an IT department that should be handling this? I'm asking because of this "Your network administrator is using Group Policy to control these settings." 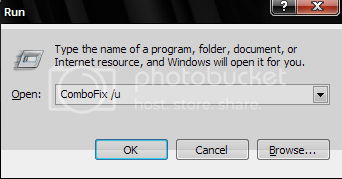 I have just now gotten the combo fix and installed recovery console from my windows disc. Isa there any thing special I should do? Or do I just run combo fix from my desk top? Here are the two logs from combo fix and hijack. Wahoo! I at least have the Windows Firewall back since Combo Fix. Just a note of appreciation, after the combo fix, I got the birght idea of updating my internet explorer, and sure enough by link problems are gone, and far as I can tell the rest of my computer is running good. Thanks again for all the help with this nasty problem. Do you know what this folder is? Can you look inside and tell me if you see any files. Something VERY important, get an Antivirus program back on your computer and running.. without it you will just get reinfected. I'm going to throw two scans your way now, one to see if there was any left behind registry keys that need to be deleted the other to show us if we missed anything. Download the latest version of Java Runtime Environment (JRE) 6 Update 7. Once done, uninstall any older versions of Java through add or remove programs. Go to Kaspersky website and perform an online antivirus scan. These scans do take a long time but are worth the wait, get a drink - go out and it will be done hehe..
Edited by Mike, 24 July 2008 - 04:53 AM. Preciate all the above tasks, and will get started on them in a few. I don't know anything about the folder you mentioned above, and I am ashamed to say I have no idea how to open this thing. I will do some research on this. Thanks again for all the advice. If you aren't familiar with the folder then delete it, if you know something you use is related to Ebay beta then keep it. The Malware report was all zero and the Kaspersky report was also zero, and I ran the antivir and below is the report from that scan. Again thanks for all your trouble, sure did help this old man out. Scanning for 1500113 virus strains and unwanted programs. [WARNING] The device is not ready. The registry was scanned ( '34' files ). If everything is OK continue with the next steps, otherwise wait and tell me about the problems you are experiencing. Notice the space between the x and / -- That needs to be there. Double Click on OTCleanIt.exe, a window will appear. Please press the CleanUp! Button. This will remove the tools we used during the process of cleaning your computer. Now that your are clean, you'll want to stay that way. Use common sense. This is the big one! Don't download programs from suspicious sites and be careful where you browse. Google the program. Read reviews and opinions from other people on the internet, if you dont see any reports of foul play - then there more than likely is none. Stay away from Cracks! However luring the thought of free software can be it's not worth the hassle and potential danger of getting infected. Download the program directly from the website of the developer - then you can be certain you haven't downloaded a bogus copy. Read the EULA (End User License Agreement) - Find out exactly what you are downloading. A good tool to aid you in this would be EULAyzer. Keep your protection programs up to date! No matter how good your Antivirus or Antispyware program is, without an updated set of definitions it will do you no good against the new infections. If you run a free program make sure to update them at least once a week. Make sure that windows updates is enabled. Keeping your system up to date is a must - to turn on automatic updates take a look at this article by Microsoft. I have listed two programs to boost your security while using no resources. SpywareBlaster Take a look at the tutorial here. ZonedOut Adds thousands of websites to your restricted zone so you'll be protected when you visit innocent-looking sites that aren't actually innocent at all. Also consider using an alternative web browser. Two big named ones, both far superior to Internet Explorer in terms of security and performance, would be Firefox and Opera. Make a habit of scanning your computer for viruses every week or so and backing up important files regularly. Please post back and tell me if everything is OK, so that I may mark this thread as Resolved.